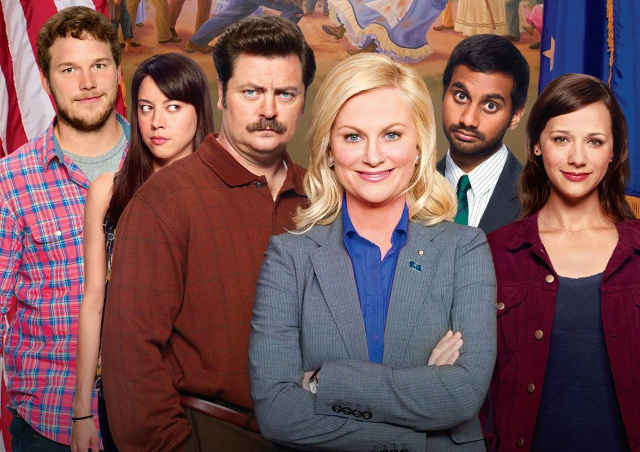 While certainly not perfect in its treatment of minority groups, US sitcom Parks and Recreation also gets a lot right, argues Iona Sharma. In a second season episode of Parks and Recreation, its protagonist, Leslie Knope (Amy Pohler), has to make a speech before a group of small business owners from Pawnee, Indiana, a town approximately the size of Guildford. “Every one of you”, she begins, smoothly, “has already made history by coming here today”. And although Leslie keeps pictures of Hillary Clinton and Madeleine Allbright on the walls of her office as inspiration, State of the Union this is not. Parks and Recreation is a half-hour NBC sitcom (previously shown on BBC4 in the UK and available on DVD), from the same creators as the US version of The Office, and if you’ve seen either version of The Office, you know something about Parks and Rec. This is taken from the cover for the DVD for season two of Parks and Recreation and shows (left to right): Andy Dwyer looking at the camera with a casual smile (red plaid shirt, grey T-shirt), April Ludgate looking suspiciously towards the characters on her left (viewer’s right, outfit indistinguishable in picture), Ron Swanson with a gruff expression (brown shirt and black trousers), Leslie Knope smiling warmly, with her arms folded (nearer to the camera and in front of the other characters, grey suit and blue shirt), Tom Haverford looking knowing, with his eyes wide and his head to one side (white shirt, dark green tie, black/grey suit) and a smiling Ann Perkins (open burgandy shirt/jacket and navy T-shirt).